Prepared by Sonal Krishan, MD; Ravi Solanki, MD; Sumer Kumar Sethi, MBBS, Department of Radiodiagnosis, Lady Hardinge Medical College and Associated Hospitals, New Delhi, India. A pregnant woman (gravida 2 para 1 with 1 live issue) was referred to our department for routine obstetrical ultrasound. There was no family history of any birth defects. Her first child was healthy. According to dates, the fetus was 31 weeks gestation. On ultrasound scanning, she had a single live intrauterine fetus with cephalic presentation of 32 ± 3 weeks by fetal biometry (Figure 1). On ultrasound, amniotic fluid appeared to be a higher volume than expected for gestational age. 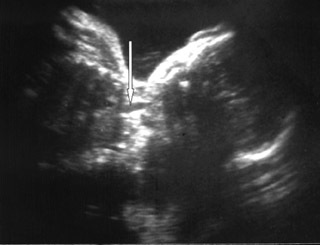 Fetal stomach bubble was not visualized during the 45-minute sonographic examination (Figure 1). Fetal skull, spine, bilateral kidneys, and urinary bladder were normal. All four fetal limbs were identified, and there was no evidence of radial atresia (not shown). 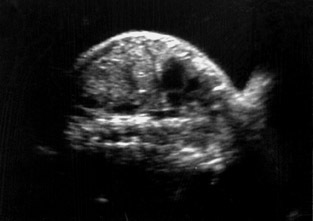 On a coronal ultrasound scan of the fetal neck, a transient anechoic tubular area was observed in the midline in the fetal neck, which seemed to distend during fetal swallowing (Figure 2). The patient had a spontaneous delivery at gestational week 36. 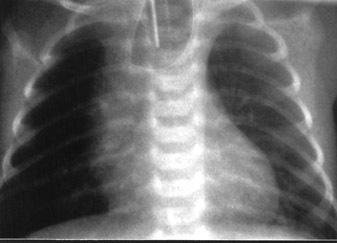 The baby was diagnosed as having esophageal atresia (EA) with the "coil-up sign" within the dilated blind-ending esophagus on the plain postnatal chest X-ray (Figure 3) and required immediate surgical treatment for respiratory distress. The operation was uneventful, and the patient was discharged in satisfactory condition. At 8-month follow-up, the child appeared to be developing normally and could be fed regularly. Prenatal ultrasonographic suspicion of EA is usually based on the presence of both polyhydramnios and a fetal stomach that is either absent or shows reduced filling. 1 The ultrasound diagnosis is difficult because there is often a tracheoesophageal fistula that allows passage of fluids and consequently causes stomach distension. Even in cases of atresia without fistula, a moderate distension may occur as a consequence of gastric secretion. 2 None of these criteria is definite. Furthermore, when the diagnosis is based on these two signs, the outcome cannot be predicted before birth. In a study by Stringer et al 3 the positive predictive value of an absent stomach bubble and polyhydramnios was 56%. There are numerous other causes than EA of an absent or small fetal bubble. These are largely related to impaired fetal swallowing due to mechanical obstruction, facial clefts, central nervous system abnormalities and neuromuscular syndromes. However, not all fetuses with CEA will have a positive neck pouch sign. In a case reported by D'Elia et al, 9 no fetal neck pouch was detected although the patient had type C CEA on postnatal follow-up. Therefore, further studies are necessary to clarify the independent diagnostic value of the fetal neck pouch sign. In addition, further investigations are needed to elucidate the diagnostic value of this anechoic area in the antenatal diagnosis of type B, D, and E CEA, which have a fistula between the proximal pouch of the esophagus and either the trachea or the distal pouch. It has also been suggested that CEA may be associated with abnormal esophageal peristalsis. 9 Fetal neck pouch sign may not be discernable in such cases. Earliest reported suspicion of EA was raised in the 22nd week of pregnancy in the presence of a small stomach bubble associated with a persistent left superior vena cava. 10 Kalache et al 7 have postulated that difficulty in detecting the pouch sign before the 26th week, even in the most common type of EA (Type C), is due to the fetus's inability to generate sufficient pressure when swallowing to permit dilatation of blind-ending esophagus. Any anechoic area in the fetal neck must be differentiated from other diseases, such as cervical cystic hygroma, cystic teratoma, or thyroglossal cyst. The anechoic area, however, can be easily differentiated from these anomalies by its transient appearance, as well as its position. Trisomy 18 was present in almost half of the fetuses in the series reported by Stringer et al. 3 If a fetal sonogram suggests the presence of EA, karyotyping should also be considered, particularly if additional anomalies are detected. 3 However, karyotyping was not done in our case. Prognosis of a fetus with a suspected EA must be guarded and is influenced by many factors, including the presence of other fetal anomalies, results of fetal karyotyping, and diagnostic accuracy of prenatal ultrasonography. Although it is difficult to determine the individual prognosis, the high probability of fetal neck pouch sign may assist in deciding perinatal management. Further, fetal MRI could be carried out in suspected cases to confirm ultrasonographic findings. Although recent ultrasound techniques have improved their diagnostic value for EA, further studies are required to prevent the many false positives and false negatives that may cause difficulty in the proper counseling of these patients. Radiological Case of the Month. Appl Radiol.